Turkish Lira vs USD: Will Turkey Recover From The Currency Crisis? Friday, US President Donald Trump announced that he would be doubling tariffs on Turkish steel and aluminium. The move was widely seen as a response to Turkish President Recep Tayyip Erdogan refusal to release a US prisoner. Since President Trump’s announcement, the Turkish lira has continued its downward slide, hitting an all time low this week. President Trump’s decision to increased tariffs against Turkey is believe to be in response to the imprisonment of American pastor Andrew Brunson. President Trump had imposed sanctions on Turkish officials with ties to Brunson’s case earlier this month before raising tariffs against Turkey. After President Trump announced new tariffs, the Turkish lira plummeted against the US dollar. The lira fell 11%, reaching an all time low against the dollar. The lira had already fallen more than 20% last week as the relations between Turkey and the US became even more strained. In total, the lira has lost more than 40% against the dollar since the beginning of 2018. The Turkish lira falling against the dollar could lead to an economic crisis. With Turkey’s currency so weak against the dollar, it could make it difficult for Turkish companies who have taken out loans in USD to pay back debts. With a looming debt crisis and recession, if Erdogan is unable to regain control of the situation, it is foreseeable that Turkey would have to turn to the International Monetary Fund (IMF) for a bailout. The Turkish currency crisis hasn’t just impacted Turkey. Asian markets have been feeling the sting, while currencies in other emerging economies have begun a decline as well. European lenders are also concerned about the fallout of the Turkish lira’s tailspin; eurozone banks have loans out to Turkey worth more than $150. French, Italian, and Spanish banks stand to be hit the hardest. Ankara has been accused of not taking action to resolve the currency crisis. As the lira began its descent earlier this summer, Turkey’s central bank shocked economists by refusing to adjust their interest rate. Erdogan promotes low interest rates and many saw the bank’s inaction as indication of Erdogan’s control over the central bank. Since Erdogan was re-elected in June, he has seized more control over economic policy, while placing his son-in-law in the role of finance minister. Experts believe the central bank will not have another option now and will have to take action to avert a catastrophe. The US sanctions aren’t the only reason the lira is struggling. The Turkish economy has been in a worrisome place for months. Turkish authorities have not addressed these issues. Instead, they are painting their currency troubles as targeted attacks. 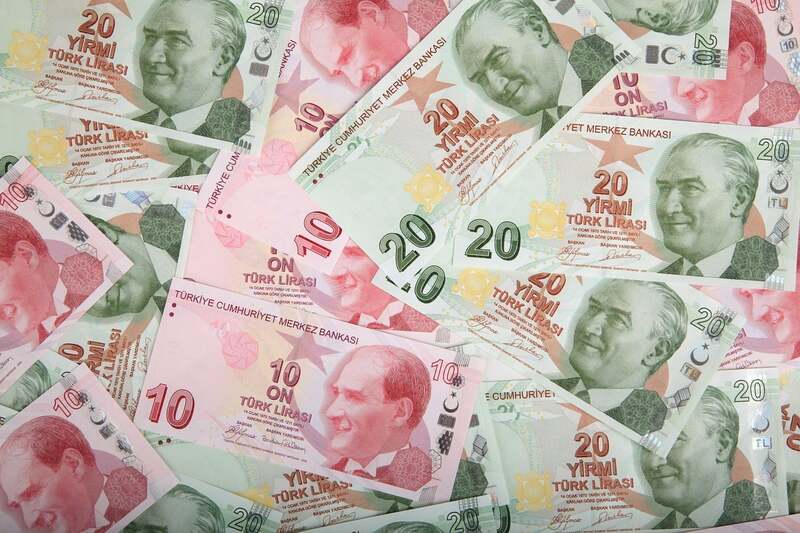 Monday, Turkish authorities announced they are investigating 346 accounts on social media which they claim are behind the erratic movements of the Turkish lira. Erdogan spoke out about the lira’s tailspin, saying, “Don’t forget this: if they have dollars, we have our people, justice and God. We will come out of the economic war successfully.” On Friday, Erdogan also encouraged the Turkish people to exchange their dollars and euro for lira. Erdogan has accused President Trump of stabbing Turkey in the back and starting an economic war. He said during a news conference in Ankara, “You act on one side as a strategic partner, but on the other, you fire bullets into the foot of your strategic partner. With Ankara looking to play the blame game and no plan from the central bank, experts worry Turkey may not recover. Brunson is an evangelical pastor from North Carolina. Turkey has accused the pastor of collaborating in the 2016 coup attempt against President Erdogan. The Trump administration insists there is no evidence to support these claims. Brunson has lived in Turkey for 23 years where he leads a congregation on the Aegean coast. A few months after the failed coup attempt, Brunson was arrested on espionage charges and accused of supporting the Kurdish terrorists. Erdogan is likely holding out on the Brunson’s release in hopes of securing a prisoner exchange. The US has refused to extradite Fethullah Gulen, a Turkish cleric and founder of the Gulen Movement. The Gulen Movement is a social movement that promotes education and religious tolerance. Gulen has been labeled a terrorist, placed on Turkey’s most wanted list, and accused of masterminding the 2016 coup attempt. Ankara has called for Gulen’s extradition from the US, where he currently lives in exile.